In late July, a trial-run was undertaken to assess the Reading Ride for Research route. This will be ‘scenic’ ride of the City that avoids the busiest of roads taking in the residential areas around the city centre (literally a 360º tour around it), the River Thames cycle path and Caversham Bridge (with great river views), a bustling weir and the Bartlett research labs and field (tree) plots. The Ride will start and end at Reading University. 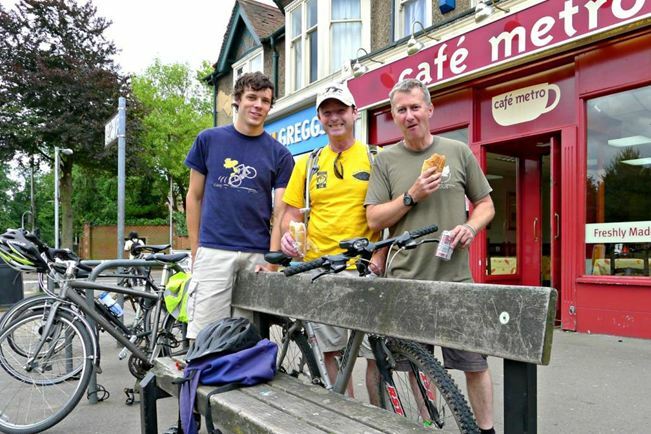 Planning the Reading ride – [left to right] Jon Banks (Bartletts), Martin Gammie & Russell Ball enjoying a road-hog lunch! Ride to the Bartlett labs for 2.15: lunch and a tour of the facilities. Arrive back at the Uni for the AA Field Day planting at 5.30: Ride ends with a pub visit! …… and the route is 21 miles long with only a few ‘hills’ between tree planting 1 & 2. Lastly, special thanks to Dave Booth at Reading Council for meeting us to discuss the ride, for liaising with the public and The Mayor of Reading, to Rupert Taylor at Reading University for organising the AA Field-Day planting and to Simon at the AA for seeing that it was possible to plant a tree at this AA event.